Kumaré is an enlightened guru from the East who builds a following of loyal disciples in the West. But Kumaré is not real. 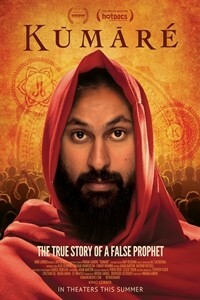 He is an American filmmaker named Vikram Gandhi, who has transformed himself into Kumaré as the centerpiece of a social experiment designed to explore and test one of the world's most sacred taboos. Concealing his true identity from all he meets, Kumaré forges profound, spiritual connections with real people from all walks of life. At the same time, in the absurdity of living as an entirely different person, Vikram the filmmaker is forced to confront difficult questions about his own identity. At the height of his popularity he reveals his greatest teaching: his true self. A playful yet genuine and insightful look at belief and spirituality, Kumaré crosses a line few have dared to cross in order to discover that from illusion, comes truth.